The trachea, also called the windpipe, is a 4 inch long tube that measures a diameter of less than one inch. The trachea begins right below the voice box (larynx) and runs down just below the sternum (breastbone). It then divides into two smaller tubes known as bronchi; each lung having a bronchus. Each time you inhale, the trachea slightly lengthens and widens, and it goes back to its normal size whenever you exhale. What are the main functions of trachea? What about other organs of the respiratory system and their functions? This is the primary function of the windpipe or trachea; to allow air passage to your lungs for respiration i.e. to breathe in air rich in oxygen and exhale carbon dioxide. When you inhale air, oxygen travels down your trachea, then to the bronchi, then to the bronchioles, and then the alveoli. If the trachea suffers from any damage, it will lead to its blockage or collapse. This will interfere with the normal air exchange, which if not treated urgently could result in death. Even though the trachea’s main function is the exchange of air, it also helps in protection from microbes and harmful substances. This, in turn, prevents entry of harmful substances into deeper parts of the lungs, which would induce malfunctioning. For protection, the windpipe’s lumen has a sticky mucous layer lining which traps foreign substances. When trapped, these foreign substances are expelled upwards and can either be excreted from the body as phlegm or swallowed in the esophagus. There are, however, some foreign objects that accidentally penetrate into the trachea. When this happens, the ciliary cells get irritated and as a result, coughing is induced. 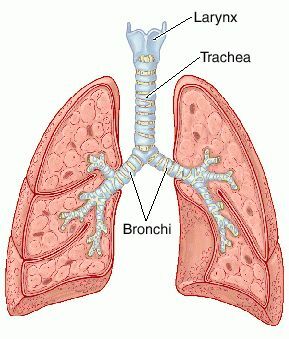 By coughing, the trachea is trying to expel those objects thereby allowing air to get to the lungs. Ciliary cells irritation can also occur when there is presence of excess mucus and infective agents which cause coughing. The trachea also plays an important role in the digestive process. Your trachea is connected to the tubing system that makes it possible for you to swallow. Your respiratory system has created a mechanism that prevents respiratory failures and choking. When this tubing system is blocked, you start choking. Choking, combined with coughing reflex, enables the ciliated cells to get the foreign object out of the respiratory system and trachea. This enhances the humidifying and warming of the air that enters the lungs. When there is increased temperature, a system is activated by the body which promotes loss of heat and the body temperature is returned to normal. On the other hand, when the air is too cold, your trachea can warm the air before it enters into your lungs, thus promoting a thermo balance. This happens when the trachea is inflamed. It results in narrowing and scarring of the windpipe. This is when an abnormal connective channel forms. The channel connects the esophagus and trachea. With this channel, swallowed food is able to pass to the trachea, and this causes grave lunch problems. This is when you inhale a foreign object, and it gets lodged in the trachea on one of the branches. A bronchoscopy is normally needed for the removal of these foreign objects. This is a very rare condition. Symptoms include difficulty in breathing and coughing. This is when our trachea is floppy and soft instead of rigid. It is normally a defect that occurs at birth. However, it comes as a result of smoking or injury in adults. This is when there is a growth or tumor which narrows and compresses the trachea resulting in breathing difficulty. Surgery or a stent is required to improve breathing by opening the trachea. They are used to inhale and exhale. The tiny nostril hairs are known as cilia. The hairs are used to filter foreign particles like dust that are present in the air. They protect the nasal passage and other respiratory tract regions. This is also called the windpipe. It filters the air you breathe and also branches to the bronchi. This is the main respiratory system organ. The lungs receive the oxygen and expel carbon dioxide. The RBC’s present in blood pick oxygen from the lungs and transports the oxygen to body cells that need oxygen. Red blood cells (RBC’s) give oxygen to cells that need it and take the carbon dioxide the cells have produced. This is a minute structure that looks like a sac. It is found in the lungs, and it is where gaseous exchange happens. This is a muscle in the lungs (bottom part) which has a dome shape, and it is where breathing begins. When you inhale, the diaphragm contracts, flattens out and is pulled downward. With this movement, lung space is increased and air is able to be pulled to the lungs. When you exhale, the diaphragm expands, reduces space, and air is forced out.